(PhysOrg.com) -- A thin sheet of plastic has been making headlines at Princeton as a magical flying carpet, after the publication of a paper describing experiments by the team with their prototype sheet of plastic that uses piezoelectric actuators and sensors to move. The sensors and conducting threads create "ripples" of air moving front to back of the sheet, and the sheet is propelled into the air. The creator, graduate student Noah Jafferis, and team described their device and findings in Applied Physics Letters, which published their article online earlier this month. The undulating ripples allow the sheet to move at a speed of a centimeter per second, and Jafferis believes it should be possible to increase the speed to about a meter per second. 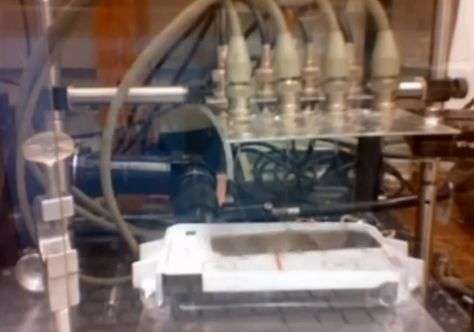 An earlier paper written by Harvard Professor Lakshminarayanan Mahadevan inspired Jafferis to look into his hovering plastic sheet project shortly after starting his doctoral studies. Jafferis at the time had been on another project, printing electronic circuits with nano-inks. Instead he turned to the plastic sheet project and spent two years working on sensors and performance improvements. A BBC interviewer was told by Sturm that it was not easy to control the sheet's behavior as it deformed at high frequencies. Even though news reports are referring to the sheet as a flying carpet, weaknesses in propulsion and lift hardly make the device comparable to magic carpets. Jafferis is careful to point out that flying should be in quotes because the object does not fly, nor does it go fast. The sheet hovers above the ground as electric ripples flow, moving air along its underside. Jafferis points out that the prototypes tiny conducting threads anchor it to heavy batteries. On the development agenda is a solar-powered upgrade that could enable it to fly over large distances. We use integrated piezoelectric actuators and sensors to demonstrate the propulsive force produced by controllable transverse traveling waves in a thin plastic sheet suspended in air above a flat surface, thus confirming the physical basis for a flying carpet near a horizontal surface. Experiments are conducted to determine the dependence of the force on the height above the ground and the amplitude of the traveling wave, which qualitatively confirm previous theoretical predictions.
" The sensors and conducting threads create "ripples" of air moving front to back of the sheet, and the sheet is propelled into the air. " ...it says it hangs on " conducting threads "...that's more like an epileptic on a swingset if it's flexing with actuators. ...also....was that filmed with a potato ? "Jafferis points out that the prototypes tiny conducting threads anchor it to heavy batteries." I take that to mean the batteries are below, not above. I kinda wish we had published it... we didn't think it was worth bothering with though, since the effect is so simple. (while still being only a few mm above the ground). using an air table, and the other with the sheet hanging from elastic threads. The propulsion only works when the sheet is suspended ~1-2mm above the ground, as expected from theory. The first video is demonstrating the propulsion caused by the traveling wave. table, and it does not move significantly. seems to "shimmer" when on. higher frequencies). Also, the second video is not displaying properly here, presumably due to skipped frames, so it does not look like a traveling wave. The BBC version is better. It is not really like a hovercraft, which pushes air down to create lift - our device pushes air backwards to propel itself forward. The sentences "He abandoned what would have been a fashionable project printing electronic circuits with nano-inks for one that seemed to have more in common with 1001 Nights than 21st-Century engineering. Prof James Sturm, who leads Mr Jafferis' research group, conceded that at times the project seemed foolhardy." were completely made up by the BBC. Has everyone else just ignored the implications using this to cool electronics? The air hugging the surface is the biggest insulating effect so by making that layer move you have a happy middle ground between passive and active cooling. Make a version of this work for water and you can decrease the time needed to boil water.